A NOVEL type of underwater microscope promises to overcome the difficulties of studying small organisms in the laboratory, by making it possible to view them in their natural habitat. Many biological processes in the oceanic world take place at millimetre scale, and have been difficult to observe in the wild. Removing specimens to study in the lab is one answer, but is far from perfect because a great deal of information and context is lost. 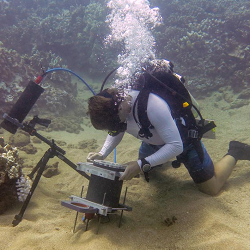 Now researchers from Scripps Institution of Oceanography at the University of California San Diego say their new Benthic Underwater Microscope, or BUM, offers an alternative. Scripps oceanographer Jules Jaffe says his BUM enables marine microorganisms to be imaged in their natural settings without much disturbance. The Benthic Underwater Microscope is a two-part system consisting of a computer providing the diver interface, and a tethered imaging unit. It is said to offer ‘nearly micron’ (thousandth of a millimetre) resolution. The instrument includes a ring of LED lights for illumination, fluorescence imaging capabilities, and a flexible tuneable lens to change focus and view structures in 3D. “This is the first instrument to image the seafloor at such small scales,” said Scripps PhD student Andrew Mullen, describing the development in the 12 July 2016 issue of Nature Communications. The underwater microscope was tested on millimetre-sized coral polyps in the Red Sea, and off Maui, Hawaii [I’m in the wrong job – Ed]. The images revealed micro-scale processes in which corals emit string-like filaments that secrete enzymes from their stomach cavity to wage a chemical turf battle to destroy the tissue of other species in a competition for seafloor space. They also captured video of neighbouring polyps on a coral colony taking turns embracing one another, a previously-unknown phenomenon the researchers call polyp ‘kissing’. The researchers also deployed the instrument off Maui after one of the largest coral-bleaching events on record. This occurs when single-celled algae living inside the polyp eject themselves during high ocean temperature events. Recently bleached corals are still alive, but in their weakened state can be rapidly invaded and overgrown by filamentous turf algae. Using the microscope, the research team observed a previously unreported honeycomb pattern of initial algal colonisation and growth in areas between the individual coral polyps during coral bleaching. These findings provide insight into a process that Scripps marine ecologist Jennifer Smith called the ‘succession of algae’ where filamentous algae settle on the ridges between coral polyps and eventually smother the living tissue. The images showed that algae are able to actively overgrow living corals during a bleaching event.